It's fall now and with all the crisp air and changing leaves has come so much busyness. Is it this way in your life too? This is my favorite season of the year, but it's amazing that I always forget how crazy those first few weeks are. So much back-to-school stuff, all the extra curricular starts up, plenty of socials, new routines... Long gone are the lazy days of summer when we slowly migrate from our beds and, often, only exchange our loungy sleepwear for loungy swimwear. Fall comes and suddenly it's busy! busy! busy! We have places to BE. We have carpools, we have homework, we have agendas. We have early mornings again and often late evenings. My husband and I were having a conversation about how we're managing our stress. Sometimes I make the mistake of classifying every tiny thing as Priority A1. I add things to my plate and they all jump up to the same importance. I say yes not because I'm timid and afraid to hurt feelings, but because everything and everyone sounds like so much fun. I have a naive optimism that surely we can fit it all in and be part of everything (do any of you struggle with the same problem?). In art, we have the subject and then we have the negative space, or in other words, all the empty space around the subject. Without negative space in a painting, the composition is too busy. There's no place for your eye to rest. You miss what could be a powerful visual because there's too much chaos. 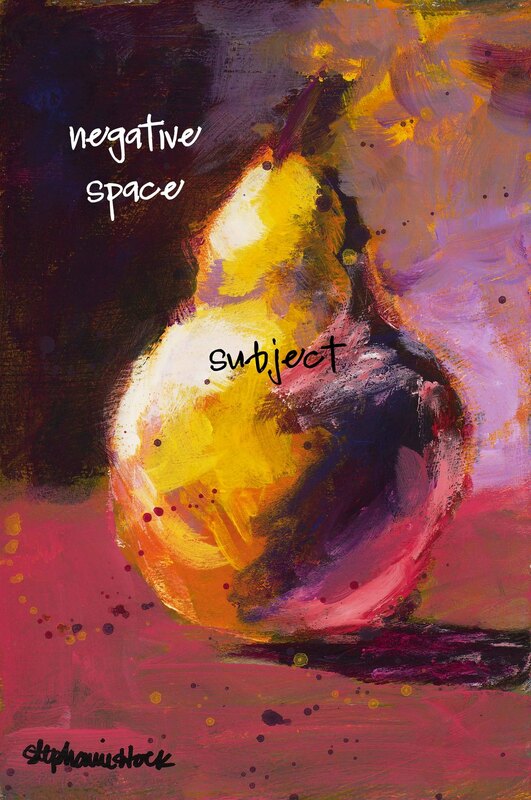 You need negative space to define boundaries. A year ago I took a fantastic workshop from an artist named Robert Burridge (if you ever get a chance, go! He is amazing and so much fun to learn from). He had us do an exercise where we kept a paper next to us while we worked that became our "mess." Any time we had leftover paint on our brush, before we'd rinse it out, we'd blot it on the paper and contribute to the mess. It was chaos of color and nothing close to a fine piece of art. After awhile, when enough paint had gathered, he had us take our mess and make something out of it. He challenged us to only paint in the negative space. I was amazed at how a crazy disaster of wayward brush strokes, could actually come together and make something really beautiful. The application of negative space defined the form and focused the painting on the parts that matter. As my husband and I talked about our busy schedules we realized the thing that was missing-- negative space. Any time anything came up, if the calendar was blank we thought that meant automatic yes's and it was creating a pretty crowded chaos. It wasn't pretty. In a budget it's that emergency, cushion fund to give you a reserve when unexpected things hit. In art it's the blank space around the subject. In life, it's leaving white spaces of nothing to give your soul a rest and keep the focus on the subjects that are most important. It's recognizing the wisdom of not over-crowding, but letting less be enough. It's understanding that balancing the positive space creates a good design. And the crazy thing is, sometimes all that negative space is pretty beautiful itself.